Yekaterina Lagno, who received Russian citizenship in July, defeated World Champion Hou Yifan in a decisive Russia versus China clash. The Russian women’s team, comprising of Alexandra Kostenyuk, Valentina Gunina, Yekaterina Lagno, and Natalia Pogonina, emerged victorious at the 2014 FIDE Chess Olympiad, which was held in the Norwegian city of Tromsø. The Russians scored 10 victories in 11 rounds. The key moment of the tournament was the seventh round when the Russians managed to defeat tournament favourites – the Chinese team – by a tally of 3-1. 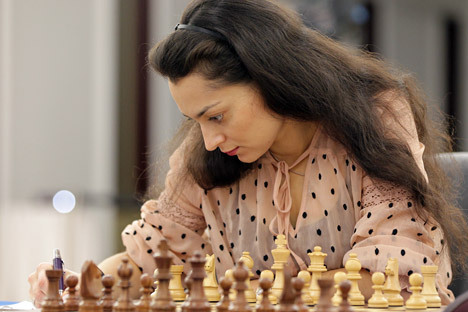 The turning point in the round was Yekaterina Lagno’s win over world champion Hou Yifan. Lagno only received Russian citizenship in July of this year. The Chinese women had to be content with the silver, and third place went to the chess players from Ukraine. The Russians had won the gold before in 2010 in Khanty-Mansiysk and in 2012 in Istanbul. Russia’s women's team was only included in the line-up of Olympiad participants at the last minute. Since the Russian side submitted its application for participation later than the deadline of June 1, the team was not initially allowed to compete. The reason for the delay was the protracted procedure of registering Yekaterina Lagno - who had previously represented Ukraine - as a Russian citizen. The Russian Chess Federation said that FIDE regulations did not stipulate any penalties for the failure to submit the application and the team could register for the international competition after the stated deadline. Eventually, in mid-July Russia’s national women chess team was granted permission by the FIDE to compete at the 2014 Olympiad. Russian President Vladimir Putin signed a decree granting Russian citizenship to former Ukrainian chess grandmaster Lagno on July 22. The citizenship gave her the green light to compete for the Russian national women team. At the press conference at the end of the tournament, the Russian team said they had not been stressed because of the situation. “The scandal did not affect the mood of the team, nor did it add any sort of additional motivation - even without that we were aiming for maximum results,” said Alexandra Kostenyuk. “Our main advantage is the Russian school of chess and its training methods. All this creates the outcome that we have shown in the last three Olympiads,” said Coach Sergei Rublyevsky. In the men's tournament, it was the Chinese chess players who celebrated victory. The Russian team finished in fourth place, behind China, India and Hungary. Based on articles first published by Gazeta.ru and, RBC and Itar-Tass.